Deputy Commissioner Bill McLemore of the Texas Veterans Land Board was on hand to discuss veterans issues in Texas at the 5 February 2014 general membership meeting at Camp Mabry. Since the days of the Republic, Texas has always supported her veterans in return for their military service. In the early days, it was in the form of land given by the state for military service in the Texas Revolution. In 1946, this tradition was formally recognized with the creation of the Texas Veterans Land Board (VLB) to administer benefits exclusively for Texas veterans. Since then, more than 200,000 VLB loans have been funded for Texas veterans. For over half a century, the VLB has been keeping the promise to serve Texas veterans, for life. The VLB Veterans Land Loan Program is the only one of its kind in the country—giving Texas veterans the opportunity to borrow money to purchase land at below-market interest rates while only requiring minimum 5% down payment. 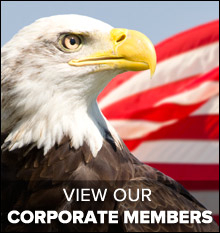 The program is easy to use, and offers Texas veterans an exclusive and unbeatable financing alternative to purchase their own piece of Texas. The bonds used to fund the program are retired from loan repayments and the cost of administering the program is financed through a small fee charged on each loan. In 1983, the Texas Legislature created the VLB Veterans Housing Assistance Program to assist Texas veterans in purchasing a home. Through this program, eligible Texas veterans have an opportunity to purchase a home with an unbeatable, low-interest loan with little or no money down. As part of its commitment to veterans, the VLB can help a veteran buy a home, then help pay to improve it through the Texas Veterans Home Improvement Program (VHIP). This program was introduced in 1986 to provide below-market interest rate loans to qualified Texas veterans for home repairs and improvements to their existing homes. Because the VA subsidizes much of a veteran’s cost to stay at a VLB Texas State Veterans Home, daily out-of-pocket rates are well below average and include the cost of medications for veterans. Residents can choose between a spacious private or semi-private room based upon availability. Alzheimer’s units at each home provide highly specialized care, including beautifully landscaped, secure courtyards. The David A. Gloier Texas State Veterans Home program was authorized by the Texas Legislature in 1997 with Senate Bill 1060 authored by Senator Jerry Patterson. Patterson now serves as Commissioner of the Texas General Land Office and Chairman of the VLB. The homes were built through a partnership between the VLB and the VA. The VLB owns the homes and contracts with professional long-term health care providers to operate each facility. Like all VLB programs, the Texas State Veterans Homes are self-supporting and cost Texas taxpayers virtually nothing. VLB Texas State Veterans Cemeteries are hallowed grounds that are an expression of our respect for the Texas men and women who have served our nation with distinction. They are exclusively for veterans, their spouse, and dependent children. They are special resting places, close to home, where friends, family and fellow Texans can honor Texas Veterans. The sacrifices they laid upon the altar of freedom will never be diminished nor forgotten. The staff at our state cemeteries are there to help each Texas veteran and their family at their time of need. Burial benefits at Texas State Cemeteries are identical to those at federal VA cemeteries. Each cemetery has opportunities for community and veterans volunteers. Please contact a cemetery directly to learn more. Texas state cemeteries are built through a partnership between the State of Texas and the federal VA, and are managed by the Veterans Land Board. They complement the four national cemeteries in San Antonio, Houston, Dallas-Fort Worth and El Paso. 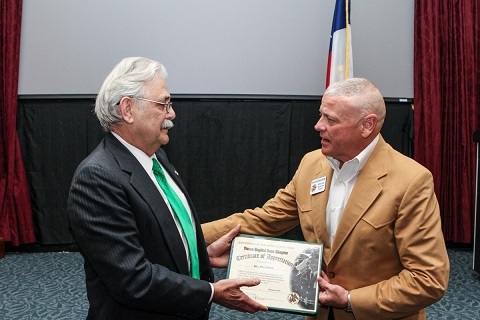 SGM Dewayne Naumann – President of AUSA Texas Capital Area Chapter presents a certificate of appreciation and medallion coin to Deputy Commissioner Bill McLemore of the Texas Veterans Land Board for his presentation on 5 February 2014.